Before my new Guardian Angel Tarot Cards arrived, I wasn't sure what to expect it would be like. The new boxed divination set is by Doreen Virtue and Radleigh Valentine, whose earlier Angel Tarot was designed to be a gentle, “safe” deck for those who find traditional tarot imagery a bit scary. I thought it hit the mark in that respect. However, the Guardian Angel Tarot is designed to be even more benign. Publisher Hay House describes the set as: "The world's gentlest and sweetest tarot cards." The description on the Hay House website gives the reason behind the deck's creation: "After the successful launch of their bestselling Angel Tarot Cards, Doreen Virtue and Radleigh Valentine knew that some people were still wary of tarot. So they created this 78-card deck and accompanying guidebook for highly sensitive people who desire the accurate and detailed answers of tarot cards, along with gentle words and images. Even sweeter than their other decks, you'll find the Guardian Angel Tarot Cards a comforting and safe way to get clear answers for yourself and others." I had a concern that the Guardian Angel cards could be a bit a too sugar-watered down, but as soon as I opened the box I was absolutely enchanted by them. Yes, the box is pink and sparkly and the images on them look like the scenes on old-fashioned sweet tins and Christmas cards, but they are truly delightful. That nostalgic, vintage look is perfect in my opinion. The cards are high quality too - and with gold edging that is the sprinkles on the icing on the birthday cake. The Victorian style of the pictures reminds me of the famous Lenormande fortune-telling cards, created in the 19th century and popular back then with ladies at tea-time in the parlour. The scenes on The Guardian Angel Tarot Cards are set in the near past and show people engaged in everyday activities - although somewhat idealised. They show children playing, lovers courting, country life and families at home. There are, of course, plenty of white-robed guardian angels too. 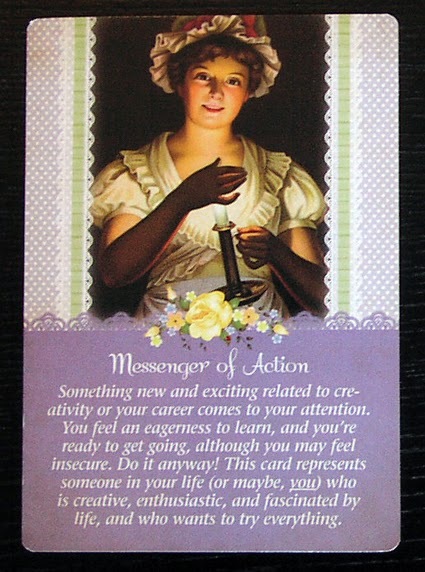 I like the way in which cards that are traditionally a bit frightening have been re-interpreted - they are gentle, but still make the right point. The Hanged Man is now a little dog standing on his head doing a trick, Death is called "Letting Go" and shows the kind of image you might find on a sympathy card while the Tower is redefined as a little girl walking a narrow bridge across a dark gulf with her guardian angel hovering just behind her. If you are going through troubled times, it can help to think some guiding force is there to support you and help you through - whether you see that as an actual guardian angel or your own higher self. That is one of the things that makes this deck gentle, but still effective. The court cards have also been given a make-over and are now friends: messengers, helpers, healers and guardians. They are less removed from ordinary people and show ladies in their Sunday best, military gentlemen and that maid holding a candle in the card to the left. Since getting this deck I've been using it a lot - not just because I wanted to review it, but because I love it. I've found the readings I've been getting are just as accurate as those I normally get with my other favourite decks. I'll continue using it too, both for readings for myself and for others - particularly for those who have never had a tarot reading before and are a bit wary.